Ants With Wings In House: It can be annoying if you have ants running around your house and they show up every time you leave food out or drop a crumb. Whether they’re small ants in kitchen or small ants with wings, they always seem to be around and crawling all over everything. The annoyance then turns into “what can I use to kill ants?” or “how can I get rid of ants in some way?” There is one way in particular that worked like a charm for me. The good news is that small black ants with wings are generally harmless. So there’s not too much to worry about other than the annoyance of them being around. Some people tend to think the presence of ants is a sign of the house being dirty or unkept, but sometimes the ants are just there. I’ve had some pretty clean houses in the past, but it didn’t seem to matter, the ants seemed to just stick around no matter how clean my house was. Granted, it doesn’t mean you can just leave food around or drop crumbs everywhere. It’s still a good practice to keep your house clean no matter what. One thing that doesn’t seem to help when you have ants around is when there is food out or crumbs that haven’t been cleaned up. The kitchen is probably the most likely place in which this is the case. Since food is generally prepared or kept in the kitchen, that’s obviously where ants would logically be most present. That being said, again, try to keep your house, and especially your kitchen, clean of food and crumbs. 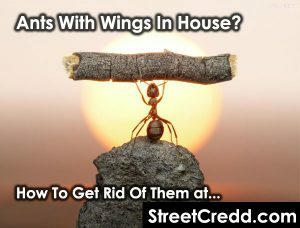 A lot of times when there are ants in your house, most of them will not have wings. Small black ants with wings are basically another stage of certain ants’ growth. When it comes down to it, it’s basic evolution. Ants with wings in house, flying ants, or “alates,” as entomologists call them, are just sexually mature ants. Created by the “queen ant” and fed by the “worker ants,” these winged ants in house are the ‟reproductives” of the ant colony. Throughout their lives, the “reproductives” go through their immature stages developing inside of the colony. When the ant colony is ready to expand, the winged ants get ready to take flight. Both mature male and female ants fly out of their colonies for the sole purpose of mating. The flight of these mature male and female ants is commonly referred to as a “nuptial flight” or “dispersal.” It is also called a “swarm,” based on the ants’ tendency to gather in large clusters during this mass exodus. Swarming helps keep predators away (due to sheer strength in numbers), and it’s why ants that fly are commonly referred to as “swarmers.” The bottom line is that it’s all about the ants’ survival. This is how and why they spread into more and more colonies. What Can I Use To Kill Ants? A while back I was having the same issue that you’re probably having right now. The ants were everywhere and becoming a bigger and bigger annoyance. To take care of the problem, there’s no way to kill them all one by one. Like a lot of things, the only way to get rid of the ant infestation is to attack the source. The next question is, “ok, so how do I attack the source of the ant infestation?” The process I used is kind of like a Trojan Horse. The heading alludes to Aunt Jemima the pancake syrup and 20 Mule Team Borax. Basically, the syrup and borax combination is what is used to get rid of the ants. The idea is to feed them Borax under the guise of pancake syrup. Basically, they’ll consume the borax without knowing they’re eating it. From there, they’ll unknowingly bring it back to the colony and spread (regurgitate) it to the rest of the ants (including the Queen ant). After a while, they’ll all die off. The last time I did this, the ants took a few days to go away. Once they were gone though, they were gone for probably a year or two (results may vary). Materials: borax, pancake syrup, and a paper plate. Get a hold of some borax and pancake syrup. If you don’t already have borax and pancake syrup, you can usually purchase them at a local super market. I prefer to use a paper plate to contain the mixture for easy disposal after I’m finished using it. Pour some pancake syrup onto a paper plate (not too much, maybe only a half a cup). Pour just a little bit of the borax powder (maybe a teaspoon or a bit less) into the pancake syrup that is on the paper plate. Mix the borax and pancake syrup that are on the paper plate together (maybe use a toothpick or something along those lines) until the syrup still looks like regular syrup. There should be a relatively large amount of borax mixed in with the syrup, but you shouldn’t be able to tell that there’s borax in it and all of the borax should be dissolved in the syrup (you shouldn’t see any of the powder in the mixture itself). Once the mixture is together and it looks like regular syrup, you can pretty much put the paper plate anywhere, because the ants will eventually find it anyway. I tend to put it on my counter or maybe a little bit out of the way, but in a place that I can see that the ants are drinking it. Wait! Leave the mixture for a day or two to let the ants drink as much of the mixture as possible. Don’t kill the ants when they’re drinking the mixture! The idea is that you want as many ants to drink it as possible! After a while, you may notice that there’s a lot of ants around the mixture. That’s a good thing! After a while, they’ll probably stop coming to it, but there will still be some of the mixture left. That’s fine, that means the ants are probably already dying off. If all goes well, you should have your ant problem taken care of within a few days. Also, if all stays well, you may see the ants come back for a while. Good luck with taking care of your ant problem! I hope this helps resolve your issue. Did this help or take care of your ant infestation? If so, please leave us a comment below, we’d love to hear from you!